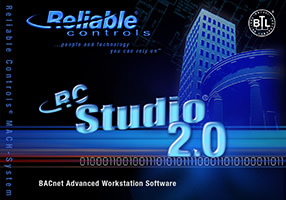 RC-Studio® 2.0 is the all-in-one BACnet® operator’s workstation software used to program and interface to any Reliable Controls products and 3rd party BACnet devices. Using RC-Studio 2.0, building operators can simultaneously open windows from multiple BACnet controllers and change setpoints and schedules, override points, view trend and runtime information, and manage alarms and network backups. Programmers have the freedom to drag and drop BACnet points to graphical displays and can read/write any BACnet point using the Control-BASIC editor. Update 1.06 of RC-Studio 2.0 has recently been released and offers a myriad of new features and functionality added to what is already considered by many in the building automation industry to be the pinnacle of DDC software. Upgrade to 1.06 – NOW! FREE of charge.